Mercedes-Benz Vans has taken a lead investor role in a 16.5m euro funding round in a start-up company that develops ground-based, autonomous delivery robots. The Mercedes-Benz Vans and Starship Technologies project uses a Sprinter with eight Starship robots. 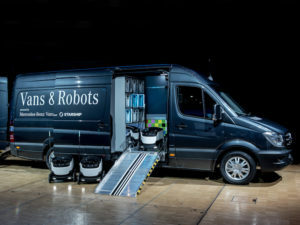 Mercedes-Benz Vans said its involvement underpins its strategic, long-term collaboration with Starship Technologies that has already developed a prototype combining the advantages of a van with those of an autonomous delivery robot. Introduced back in September 2016, the development uses a Mercedes-Benz Sprinter as a mobile loading and transport hub for eight robots, and was showcased at this month’s CES 2017 show in Las Vegas. Pilot projects combining Mercedes-Benz vans and delivery robots are planned to be initiated in Europe over the course of this year. The plan is to begin widespread testing of the joint concept with one or several logistics partners. The launch of the pilot project in a real-world environment is scheduled to take place later this year. Mercedes-Benz Vans is to invest some 500m euros in the advancement of digitisation, automation and robotics in vans as well as in mobility offerings until 2020.